Hello foodies………after a long festive season of Navaratri and Dashera, today comes the day of Eid-Ul-Adha! So, it's again turn for a special recipe for you! 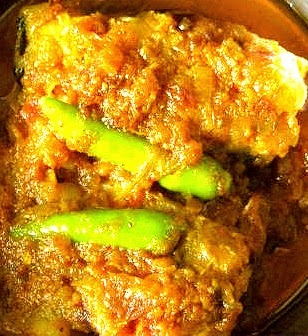 This Eid,; try a Bengali spacila Hilsa-dish, I think, you never taste that kind of hilsa before…..hope you will love it! 1. Wash the fishes, marinated with little bit of turmeric powder & Salt for 5-10min. 2. Grate the pineapple and keep aside. 3. Fry the fishes lightly in a pan and keep aside. 4. In the same oil, add bay leaves and Green Cardamom pods till this smell. 5. Now, add the onion paste and fry till it become brown. 6. Add the grated pineapple and cook for 3-4 min. 7. Add the red chili powder, turmeric powder and salt with ½ cup of water and mix well. Cook again 2min. 8. Now, add the Hilsa fishes with 1cup of water and stir well. Cover and let it cook on low flame until it become thick. 9. Serve hot with hot Rice or Polaw. * If you love to eat sweet more than salt, add 1tablespoon of Pineapple Jam in it. That’s all for today. Please give me your feedback about the blog. Take care and a very happy Eid-Ul-Adha to you all.